The taxi driver who had arrived to pick up the rest of the family could scarcely have expressed more astonishment if I’d announced I planned to ride my bike to the moon. enough to navigate by bicycle, it seems. 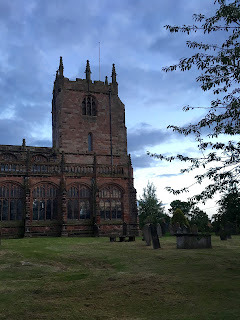 Yet the taxi driver’s scepticism about my plan to ride the 30 or so miles from Bunbury in Cheshire to my parents-in-law’s house near Neston on the Wirral would turn out to be better founded than I expected, albeit for reasons other than simple endurance. Once I’d finally, rather inefficiently, fixed my puncture, I ended up wasting around an hour trying to work out a route through central Chester, even though I know the city reasonably well, had a map of sorts and cycle in the city more than any British city other than London. The experience made me realise the fundamental shortcomings of one of the most popular ways of providing cycling infrastructure in the UK and many other parts of the industrialised world - sticking it on disused rail lines, canal tow paths and other places where it won’t get in motorists’ way. The challenge, I came to realise as I took wrong turn after wrong turn, is that such approaches are fundamentally at odds with how nearly everyone understands cities and how nearly everyone travels. If a determined urban cyclist such as I, with a map, iPhone and some familiarity with the city, can’t find my way through the system, it’s hard to imagine these routes will tempt many novices into starting to cycle. As with many cycle schemes worldwide, however, the primary purpose of the routes through Chester barely seems to be to serve the needs of real, practical cycling. Instead, at points I felt as though I were cycling through some developer’s brochure for the new housing by the banks of the Shropshire Union canal. I imagined how some planning official had sighed with relief when the cycle paths were added to the development plans. The city had ticked the “green and sustainable” box in their programmes. I didn’t sense much confidence that anyone genuinely expected many people to cycle. Until something fundamental changes in how routes are constructed, the circle of poor design that leads to low use that leads to further poor design will remain unbroken. 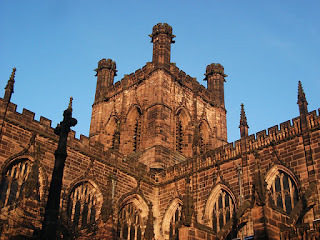 The hold-ups in Chester were a particular pity because some of the early part of the journey was positively uplifting. I was in Bunbury at the end of a week’s holiday cruising the scenic Llangollen Canal. We were heading to the Wirral to see my parents-in-law. After I’d fixed the puncture, I found myself slipping along mostly quiet country lanes, rolling past the entrance to Beeston Castle and negotiating sudden, sharp climbs on bridges over the canal or neighbouring railway line. The experience was a fine advert for the not-always-enjoyable experience of cycling on roads in the British countryside. But the trouble started as soon as I reached the outskirts of Chester. My intended route - variously labelled as National Cycle Route 45 or Regional Cycle Route 71 - started taking unsignposted turns through the villages of Waverton and Christleton. It then deposited me onto the Shropshire Union towpath, where the signage was so confusing that at one point I cycled back the way I’d come, convinced I’d taken a wrong turn, only to discover I had been going the right way all along. Something else had also changed. By this time, I was negotiating a towpath through a distinctly unglamorous area on the east side of Chester. The canal was surrounded by the blank walls of neighbouring buildings. I became distinctly conscious of having relatively little space between the blank, overlooking walls and the canal’s forbidding-looking water. Had it been dark or had I been a woman, I’d have felt distinctly uncomfortable. I started to remember Jane Jacobs’ strictures in The Life and Death of Great American Cities about the importance of having eyes on the street, precisely because there were no such eyes on this towpath. I started to feel an urgent need to get away from the canal. That, however, wouldn’t prove easy. Although the new, waterfront developments in central Chester make the towpath there feel far less threatening, it remained nearly impossible to work out which way I had to go. Routes off the towpath that I tried took me towards a meandering, riverside cycle path that would substantially lengthen my journey, onto a busy, car-clogged road engineered to steer traffic away from anywhere useful in Chester’s ancient centre, and onto residential streets labelled as a “home zone” full of traffic calming but with no signposts for cyclists pointing anywhere other than the railway station. An information point for cyclists directed me towards a “black route” and a “brown route”, information that was of no value to someone who did not know the colour of the route towards Neston. Finally, in frustration, I struck out, on busy roads, in the general direction of the cycle path heading where I needed, which runs along an abandoned railway. Having found a bridge that passed under the route, I cycled parallel to it until I found a way on. Yet it remained obvious, once I’d made my way onto the old railway line, that the route was hardly being used at all for the purposes that the signs seemed to foresee. While the signs pointed people towards local destinations, the cyclists that I saw either seemed to be training for road-bike racing or, like me, to be making longer journeys. The route was akin to a cycling motorway - a great means of making long, inter-urban journeys but a poor method of undertaking short-distance trips. The light use of the route reminded me of the complaints I heard shortly after the opening of Birmingham’s Metro light-rail system. The system was free of interference from motor vehicles because it ran along an abandoned railway line. But the operators found potential passengers tended to stick to a parallel, slower bus route because it allowed them to stick to the street network, which they could understand. The shortcomings of the area I sought to navigate were very similar. The centre of Chester - a walled city founded by the Romans - is surrounded by busy arterial roads. There was no real attempt to provide a hospitable cycling environment either on those roads or to carry cyclists across them. In riding along the towpath into the city centre, I had inadvertently trapped myself in the middle of the city walls. There was no pleasant or easy way that I found for getting out again. Both the towpath and the railway line were largely isolated from the system of streets that most people understand to make up a city. The problem, it occurred to me as I rode on to Neston, was that the routes through Chester had not taken cyclists’ needs as their starting point but those of planners charged with finding a use for a troublesome old railway line or for finding a better use for the canal towpath. The attempt to signpost such a route for short-distance journeys seemed to me to misunderstand the way that most people’s short journeys actually work. If going shopping or on some other errand by bike, I will generally need to go to several places, rather than making the kind of clean trip from point A to point B that might be facilitated by a path that takes me entirely off the street network. While I don’t want to ride on a terrifying stretch of high-speed urban road, it’s not, either, a particularly pleasant experience to ride through one of England’s most picturesque, historic cities staring at the featureless grass bank of an old railway cutting. The challenge is not so different from those in New York presented by the city’s heavy reliance on waterside paths like the Hudson River Greenway. Such paths are by their nature cut off from the hustle of city streets. They are useful only if one presupposes that cyclists are willing to make significant detours for the privilege of riding unmolested by drivers. The solution to some of the problems of Birmingham’s tram has been to extend the end of the route out onto the city centre streets, into an area passengers can understand. Rail lines and towpaths would make far better cycling routes if there were a concerted effort to open them up in the densest urban areas so that they feel integrated with surrounding streets, rather than like hunting grounds for the area’s muggers or hiding spots for underage drinkers. 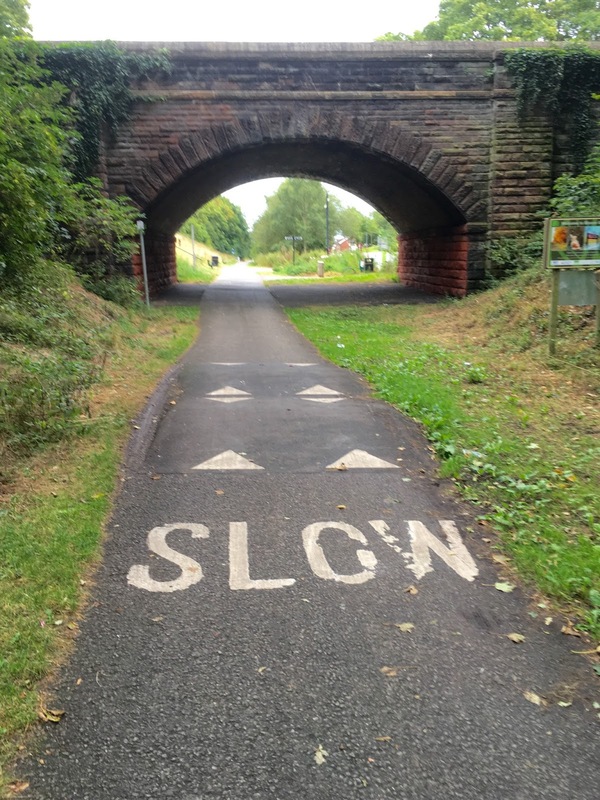 The downside to that from planners’ point of view would be that old rail lines or towpaths would no longer be simple, cheap places to hide cycling but would demand changes on neighbouring roads and disruption to traffic flows. Yet the frustration is that there is a genuine role for paths like the Chester to Connah’s Quay path, when they can be found. The opening of a new link to the rail path now allows me to cycle between Chester Station and my parents-in-laws’ house near Neston without braving any part of the frequently scary A540 road, which I used to have to use. Even with my long delay in Chester, I still arrived at my destination only a little after the rest of the family. They’d had to take a taxi into Crewe, a train from Crewe to Chester, another train to Shotton then a third train on to Neston. In areas with public transport options as poor as those, routes that allow one to cycle 30 miles at speed can be a viable alternative. I would even have been able to make the journey fairly quickly if the signposts had been more informative. As I rode out of Chester, I noticed, with a sinking feeling, that my route was passing the canal towpath and there was a link between the two. I could have stayed by the canal and avoided all my frustrations. For the moment, however, cycling facilities all too often remain projects to be done on the cheap, to revitalise wasteland. They seem far too often aimed at getting bikes out of drivers’ way than at finding a way to get drivers out of cyclists’ way. As long as the fundamental misconceptions about design remain, I’m likely to keep finding myself lonely in using such paths as genuine means of practical transport.